Eilid brings us the gentleness and grace of the feminine principle. ...Opening to the qualities of the hind will enable you to achieve a greater degree of sophistication subtlety and elegance - in the best possible senses of these terms. 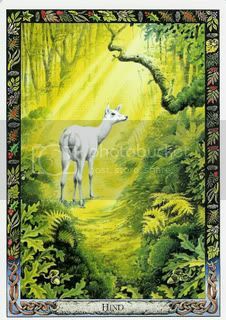 Deer, and the white hind in particular, call to us from the Otherworld, from the realm of Faery, and invite us to look beyond the superficialities of life, toward the heart of things, toward the realm of causes rather than effects. Poised in moon-or sunlight, Eilid invites us to begin an exploration of the Otherworld, of the spiritual dimension of life. I'll just say what I see. The colours of this card stand out in stark contrast to those of the blackbird card. The greens are so yellowed, so new, they seem fresh, as they do in Spring. The bracken or ferns are lush and verdant. The oak around the edges of the card is sporting acorns, would they be fully-formed in the Spring? If not, perhaps the season is closer to Summer, however I really feel the invocation of Spring. The sunlight on the hind (who is showing us her hind!) seems to be illuminating a small clearing or a path through the forest. There is a real warmth to the card, and a lovely stillness. Deer in general imply stillness and silence and serenity to me. Perhaps because without those elements present it is unlikely a deer would remain! The light shining down as it is indicates to me a serene and treasured moment frozen in time, or taken out of time. To catch sight of a deer in the forest is to catch your breath in the hope that the balance of the moment will not be upset. In those moments (whether figurative or literal) I always feel that should I breathe, the scales will be tipped and something beautiful will be lost. The stance of the hind also puts me in mind of vulnerability, something delicate and precious. White often stands for purity and seems an appropriate colour for her. Just some thoughts to begin with. Perhaps more will folow. Donata - could we have a picture of the card added to this thread? Like the blackbird? Hope so! Any other thoughts on this card out there? I'm going to get the cards scanned and posted soon. Watch this space! Thank you so much Selene! Argh! Kinda smallish but the best I could do for a pix...oh well. Roads are meant for journeys, not destinations.